Continuing our last topic, the tips to do scuba diving in Gili Trawangan Indonesia, now we want to give you another one. Still about Gili Trawangan, but not about its wonderful attractions or the kinds of sport that can be done there. Instead, the topic for today is the places to stay in Gili Trawangan Indonesia. When spending a day or two in a nice place like Gili Trawangan, you would like to stay in the most comfortable place possible. Of course, the one that really suits you. Thankfully, this tourism area is completed with some choices of hotel and resort that you can choose. See more of them below to find the best one for you. As the first one inside the places to stay in Gili Trawangan Indonesia. The Aston Sunset Beach Resort is the one that always included as one of the best location if you want to spend some days around Lombok or Gili Trawangan in general. The location of this place is very strategic, just some meters from the beach lips. With the name Aston in front of it, the resort got an overwhelmingly good reviews from the past customers. Aside from the hospitality, the facilities here are also pretty complete, like the room service, private swimming pool, and also entertainment. Moving from the first one, we’re going to the Trawangan Resort. Different from the first resort, the location of Trawangan Resort is not located around the area of the beach. But instead, it’s located not far from the beach, making the price of it more affordable. The place is also having a really modern design with the cleanliness and its simplicity. The resort is not that wide, but it can fill up many people. The management did a really great job in order to place everything in its place. However, there are three choices of a room that you can pick, such as the Standard Room, Deluxe Room, and the most expensive one, the Villa. For more natural design of a resort, then this Pearl of Trawangan should be included inside your options bucket. With the unique design of architecture from Lombok, the Pearl of Trawangan can give different nuances. You can see the traditional design in each room, icluding the most affordable one. So each room has a curve rooftop that looks so unique. Plus, almost all the materials used for building the resort are the woods, the high-quality ones. The tourists can enjoy the resort with so many choices of room, starting from the Wooden Hut with two beds with Rp1.200.000,- to the most expensive one, the Pearl Villa, with your own private room and the whole building for yourself for about Rp3.600.000,-. If you’re looking for a hotel that located near a beach of Gili Trawangan, Vila Ombak Hotel can surely fill you up with its wonderful design and friendly hospitality from the staff. 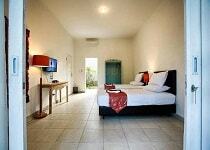 The hotel can serve you kinds of room, from the most basic one, just square-shaped room, the hut, or even a villa. You can pick one of your favorite of them. However, the Vila Ombak Hotel is actually the oldest hotel around Gili Trawangan, and also the biggest one. The place is highly reputable and sometimes used by important people, including the movie actors and people from the government. With a nice looking pool and wonderful room services, staying in Vila Ombak Hotel would be a memorable experince. During holiday times like this particular month when you can see so many red dates in Indonesian calendar, most people would pick Ombak Sunset Hotel. The reason? Aside from the location of this hotel which is near a beach that iconic for its swing (that always show by everyone vacationing in Lombok), the hotel also has a reputation for being a hotel with the most kind staffs. The staffs, like said by the past customers, are always kind and helpful to the tourists, even the local ones. They are always be ready to help the customers to give to most pleasurable experience by staying in a wide, clean, and comfortable room of Ombak Sunset Hotel. The price of each room is also very reasonable. Next one in the best places to stay in Gili Trawangan Indonesia, we want to include this place called Alam Gili Resort. The Alam Gili, unlike the others, seems to be the most simple one you can get in all areas of Gili Trawangan. If you happen to be a backpacker who want to stay in an affordable room with the most natural design possible, then this is the one. The place does look very simple with its wooden factors that you can find on each corner of the room. It’s really quiet and comfortable here. Starting from Rp800.000,- only, you can get a private room, with the sea breeze (no AC), and nature as your best friend. A little bit random here, around Gili Trawangan, you can also find a lovely place like PinkCoco. With the word Pink in front of it, you can expect something pink out of this place. Just like the name implies, when arriving at PinkCoco Hotel you can see the pink color in almost every thing your eyes can gaze. Even the candle holders are colored in bright pink, so do the sofas. But wait until you see the room. If you happen to love the pink color, then staying in the room could the best experience for you, because everything is pink. The bed, wallpaper, even electronic stuff like television is decorated with pink. You can enjoy it starting from Rp900.000,- only. 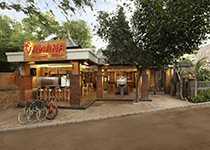 The Natya Hotel is one of the simple hotels you can get around the area of Gili Trawangan or Lombok in general. The room in the Natya Hotel is decorated with coastal elements, like the blue color that resemble the ocean and the sky. Plus, they add some additional stuff to make it more cozy like AC, entertainment stuff, and also the services like Spa and Resto. Other than that, you can still find the coffee shop, which is pretty convenient in a place like this. If you want to go somewhere, the hotel also serves the bike rental service for a small price to pay. With the price starting from Rp500.000,-, you can have a complete hotel services. 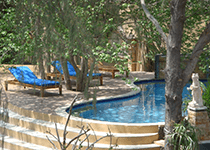 Another one in the places to stay in Gili Trawangan Indonesia is Oceano Jambuluwuk Resort. Like one of the hotels mentioned above, the Oceano Jambuluwuk Resort also use the traditional design of house in Lombok for the outdoor room. You can see the design in the rooms that located just beside the pool and the palm trees that planted around them. The resort is more modern and completed with so many facilities the customers can enjoy starting from the BBQ service, the outdoor pool, a gym, massage service, lounge, and also the coffee shop and restaurant. If you want to spend the evening, you can go to the bar and enjoy some nice cocktail there. The next one is Vamana Resort, a resort that combined the Balinese aspects with the simplicity from modern design nicely. From the outside, you can see the interesting Balinese design of a building with the wooden materials that put together with a rattan from the forest in Indonesia. You can see the modern aspect in the room though. Most materials are woods with the dark and light brown that can be seen on the floor walls, and the windows. The brown color combined with the white bed, pillows, and sofas, making it looks so nice. It’s very comfortable to stay in the resort for days because you can have this comfyness with all the wonderful services they can provide. For more unique resort, you can book a room at the Les Villas Ottalia where you can have a very beautifully designed room just for you. Located not far from the iconic Gili Trawangan Beach, everyone can reach this villa easily. Each room is nicely built by using the wooden materials on almost everything. From the door, walls, and even the mirror decorations are made of wood. With a certain good smell plus the additional services, it would be a nice experience of staying in the Les Villas Ottalia. The boutique resorts are booming in this country these days. 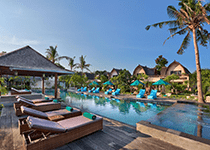 Almost everyone wants to spend a day in one of them including the Gili Akmor Boutique Resort located in the strategic place of Gili Trawangan, Lombok. It’s located about 5 minutes from the white beach of Gili Trawangan, there are two choices of room you can get in the resort with the bright and minimalist design, the standard and deluxe room. 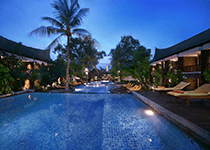 And the last one in the places to stay in Gili Trawangan Indonesia is Devaju Hotel. This hotel serves the customers with two main rooms, the twin that has the double beds and standard room with the big bed that can fit for two. Each room has the basic services like the free wifi, LCD TV with collections of interesting programs, AC, and the bathroom features. The hotel also located about 2 minutes from the famous turtle beach.